Like many small mammals that are kept as pets, a rabbit has teeth that grow continuously throughout his life. Rodents such as guinea pigs and hamsters chew on wood to keep their teeth ground down. A rabbit doesn't need wood to chew on, and keeps his teeth at the proper length by vigorously chewing his food and grinding his upper and lower teeth together. Malocclusion, or misaligned teeth, leads to overgrown teeth because the rabbit can't keep them ground to the proper length. 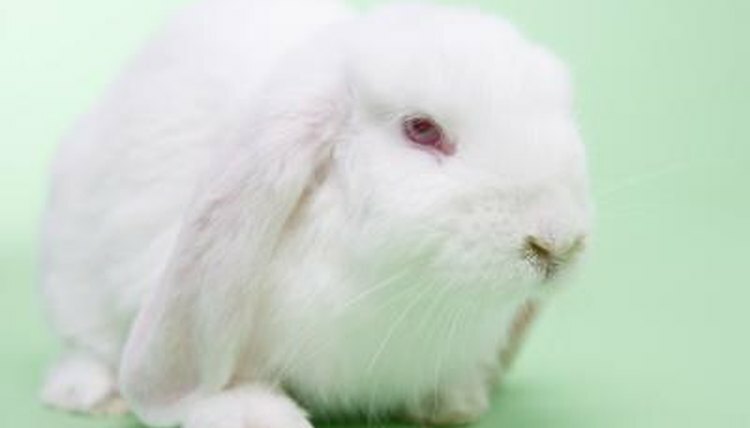 Dental disease is one of the most common reasons for pet rabbits to visit their vet. Rabbits have 28 teeth made up of six incisors and 22 molars, called cheek teeth. There are two long incisors on top with two shorter ones right behind them, and two on the bottom. The rabbit uses his incisors for grasping and biting off chunks of food and his cheek teeth for chewing and grinding his food. When he is at rest, his upper and lower incisors touch, but he has to realign his jaw for the molars to meet so he can chew his food. Normal chewing and grinding wears down the teeth at a rate of about 1/8 inch per week. Misaligned teeth do not meet properly so the teeth overgrow, causing painful ulcers of the cheeks and gums. Genetic problems and facial trauma can cause malocclusion. The second leading cause of overgrown teeth is poor diet, according to VeterinaryPartner.com. Sick and weak rabbits may not be able to keep their teeth ground down. Any time your rabbit is sick, keep an eye on his teeth. A pet rabbit with malocclusion may not be able to fully open his mouth or chew his food properly. Improperly chewed food can lead to diarrhea. The long, pointed teeth cut into the soft tissue of the cheeks and tongue, causing ulcers. It may become so painful that he refuses to eat and loses weight. You may also notice drooling or excessive tooth grinding. Malocclusion caused by genetic problems or trauma needs regular vet care. Your vet will clip the incisors and grind down the molars to the proper length and treat ulcers that develop inside the rabbit's mouth. Pet rabbits who eat pellets exclusively develop overgrown teeth because they eat a smaller volume of food and because the pellets don't need enough chewing to keep the teeth ground down. If your rabbit's teeth tend to overgrow, remove pellets from his diet and feed him hay and fresh vegetables instead.